Alstom and its partners of its local South African joint venture company Gibela, have now moved since last week in the new factory and training centre complex in Dunnottar, Ekurhuleni which has now become Gibelas corporate offices too. The plant construction is now almost finalized, on schedule less than two years after the start of the construction. 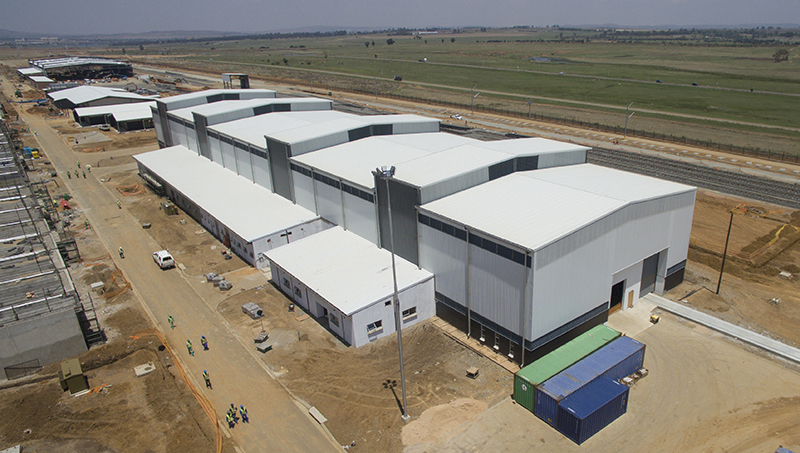 Gibelas current 400+ fulltime employees are now based at the complex at 2 Shosholoza Avenue, and work begins on the manufacture of the first of 580 six-car X-Trapolis Mega commuter trains to be built over the next 10 years for the Passenger Rail Agency of South Africa (PRASA). At peak production more than 1,000 employees are expected to be manufacturing an average of five trains a month. Moreover, of 65 apprentices selected during 2017, most have already begun their training at the Gibela training centre. By the end of the first quarter of 2018, the first trains car body shell essentially, its metal panel-clad metal frame is expected to be completed. By the end of 2018, the first South African-built train should be ready for delivery to PRASA. Alstom is very proud of the progress made by Gibela in less than 2 years to finalize the construction of the plant, in Dunnottar. The completion is underway for March 2018. All teams are now on board and ready to start the manufacturing in a brand new factory with new staff and a new supplier base said Didier Pfleger, Senior Vice-President for Middle-East and Africa. 18 of 20 trains built at Alstoms Lapa, Brazil factory using South African materials and involving South Africans have been in commercial service part of 2017 and are estimated to have already clocked up, in total, more than half a million kilometres. One of the two trains built in Brazil the other one will still be used for testing purposes will now be based at Gibelas training centre in Dunnottar, where it will be instrumental in the training of some 19,500 artisans and technicians. To meet its local content commitment of at least 65% of contract value, Gibela has on-boarded so far 54 South African suppliers to supply materials, parts and services. More than 4,700 South African jobs are being supported by the companys activities. Alstom has been present in South Africa for many years and was awarded this 4 billion contract by PRASA in October 2013. The contract also includes 19-year service agreement.